With so many questions coming through about whether there really is a Wanda, we thought it was a great time to introduce the business’s founder & owner, Wanda Balestri! Wanda founded what was formerly known as Wanda’s Weeding back in 2005, when she wanted to return to work after having children. “I was working in the corporate world before I had children, but wanted to be a hands-on Mum too and the two don’t really go together,” said Wanda. “After growing up in a self-sufficient environment in the Pilbara as a child, I’ve always had a real love of horticulture. So when I decided to return to work, I thought it would be wonderful to be able to return to my roots,” she said. With word-of-mouth quickly spreading, the business soon began to flourish and she put on her first employee shortly after. By 2013, her small gardening business had become so busy that Wanda could no longer manage it all on her own. It was then that she decided to employ her husband Enrico as her Operations Manager. “That’s the trouble with being a sole operator in business – you only have so much time,” said Wanda..
“I just didn’t have the time, and I really needed that support of someone to go out and visit my clients every day. 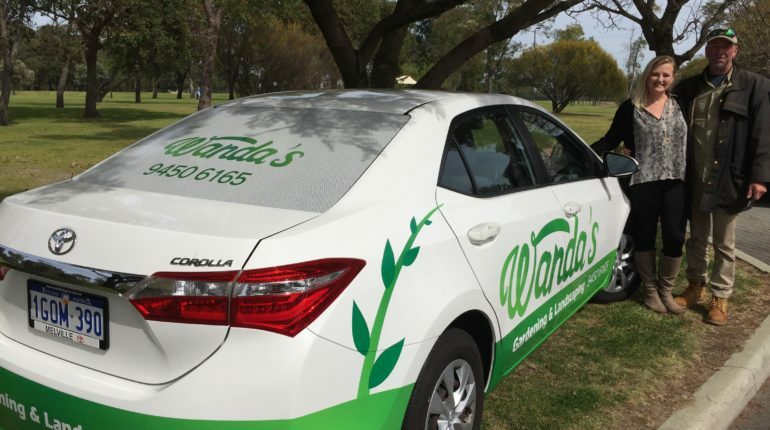 More recently, the business enjoyed a re-brand, changing its name to Wanda’s Gardening & Landscaping in 2017. Wanda now has Seven staff working for her. So, what’s it like working with your husband every day? “Enrico and I have known each other since I was 14, and we got together when I was 21,” said Wanda. “So we’ve known each other for a really long time. Interestingly, even though we now work in the same business together we aren’t in each other’s space because he is out every day,” she said. With plans for additional branches throughout Perth, the future’s looking rosy for Wanda and her team. For more information or for a quote, call Wanda today on 9450 6165.